Samsung reveals Galaxy S5 flagship phone | What Hi-Fi? The Samsung Galaxy S5 is official, revealed to predictable fanfare at the Samsung Unpacked event at Mobile World Congress in Barcelona. The new Galaxy flagship phone promises to "focus on what matters most to consumers" and to offer a "refined experience with innovation of essential features", and is set for worldwide release on April 11th. New for Samsung's 2014 top-dog phone is a Finger Scanner, mirroring the fingerprint sensor on the iPhone 5S, and dustproof and waterproof certification, similar to Sony's new Xperia Z2, also announced at MWC 2014 today. 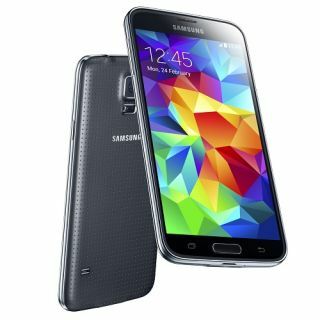 Samsung claims to be "going back to basics" with the Galaxy S5, perhaps a grudging acceptance that much of the software and Samsung apps on previous models - bloatware, as it's known by many people - was never overly popular. The S5 has a 5.1in full HD Super AMOLED display, sports the Android 4.4.2. Kitkat OS and claims to combine an advanced camera, fast network connectivity and a range of enhanced fitness apps, bolstered by the inclusion of a new heart rate monitor. The phone also works with the new Samsung Gear smart watches. Samsung has focused on the camera, "one of the most important smartphone features today", claiming it has the world's fastest autofocus, at up to 0.3 seconds, and a range of new image enhancing features for the 16-megapixel camera. Fifth-generation WiFi and LTE 4G networks are provided, while the new Download Booster aims to improve data speeds even further by "bonding WiFi and LTE simultaneously". A perforated design on the rear casing of the S5 aims to improve the much-maligned plastic body of the Galaxy phones, and it will come in a range of colours: charcoal black, shimmery white, electric blue and copper gold. Anticipation for the Galaxy S5 has been high, and Carphone Warehouse has said it has had 130 per cent more pre-registrations for the new handset when compared with its predecessor, the S4. We're on the ground at MWC 2014, so look out for a hands-on review of the new Samsung Galaxy S5 very soon.